The 'Great' Sejm also known as the "Four-Year" ordinary confederated Sejm held in Warsaw under rules of the Confederation of Two Nations. 1788 r.
Convened on May 2, 1788, the Sejmiks (regional assemblies) were held on August 18, 1788. Then they reassembled on September 28, 1790 to elect a second complement of Deputies. The Great Sejm debates began on October 6, 1788. It went into session under the rules of general confederation to make it immune to the threat of liberum veto. Its Marshals were: Stanisław Małachowski – the justiciar of the Crown, and Kazimierz Nestor Sapieha - the Lithuanian artillery general. The Sejm, originally convened to consider a proposal for a Polish-Russian alliance, soon turned into a scene of turbulence marked by attempts to reform the Polish-Lithuanian Commonwealth State. The Sejm, as the organ of the highest authority, took over all the representative, legislative and executive functions. On October 20, 1789, a bill of military auctions to raise the total troop strength to 100,000 was enacted by acclamation. 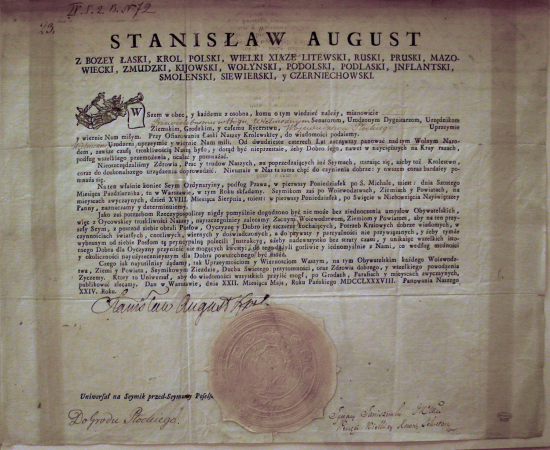 On January 19, 1789, the Sejm abolished the Permanent Council in an act signifying the regaining of independence and abolition of Russia’s protectorate. It ruled on the evacuation of Russian troops and their warehouses from the territory of the Commonwealth. On June 22, 1789, it passed a constitutional law on the general inventory of “household chimneys” and thus a population count, opening up the way to a general census. On September 7, it elected a Deputation (working party) on the Form of Government - a group of Deputies tasked with presenting proposals for reforms of the political system of the Commonwealth. The Sejm appointed numerous committees to deal with financial affairs, economy and the military. 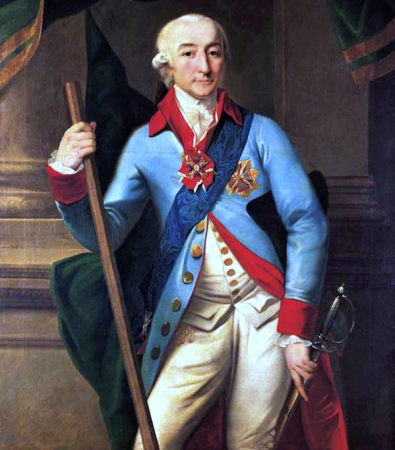 On March 29, 1790, a mutual defense alliance with Prussia was signed. On November 16, 1790, new elections for the Sejm were held, and a new composition of deputies resumed the assembly on December 15, 1790. On September 13, 1790, the Sejm restored the king's right to confer public office titles, of which the monarch had been stripped back in 1775. On April 18, 1791, the Sejm passed a Free Royal Cities Act which granted the townspeople of the royal cities a range of new public rights. On May 3, 1791, the Sejm enacted a Constitution changing the Commonwealth political system into a constitutional monarchy. On October 20, 1791, detailed provisions were adopted for the Constitution of May 3, entitled The Reciprocal Guarantee of Two Nations. 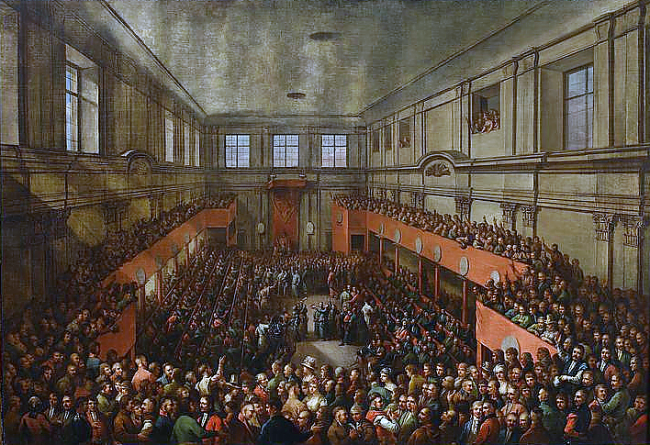 The Sejm held its last meeting on May 29, 1792. Its activity was interrupted by the Polish-Russian war, which broke out in April 1792. See: W. Kalinka, Sejm Czteroletni (Four-Year Sejm), Lwów, 1881-1886; B. Leśnodorski, Dzieło Sejmu Czteroletniego (Work of the Four Year Sejm), Wrocław 1951; W. Konopczyński, Dzieje Polski nowożytnej (History of Modern Poland), vol. 2, Warsaw 1986; W. Szczygielski, Sejm Wielki (Great Sejm (1788-1792). Study on the history of the gentle revolution), Łódź 2015; Ł. Kądziela, Narodziny Konstytucji 3 Maja (Birth of the Constitution of May 3), Warsaw 1991; J. Michalski, Sejm w czasach panowania Stanisława Augusta (Sejm during the reign of Stanisław August), in: Historia sejmu polskiego, vol. 1, Warsaw 1984, edited by J. Michalski, pp. 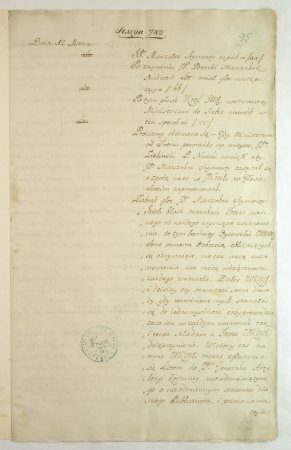 350-419; R. Łaszewski, Polish Sejm in the years 1764-1793. Historical and legal study, Warsaw 1973; W. Filipczak, Sejm Rzeczypospolitej w dobie stanisławowskiej (Sejm of the Commonwealth during the reign of Stanisław August), in: Between the constitution of Nihil Novi and the legislation of modern democracy. 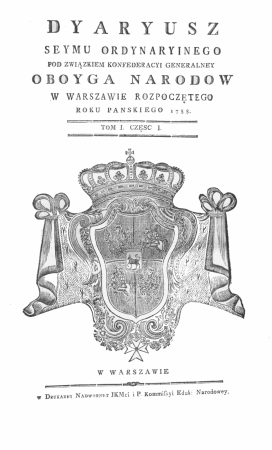 Polish parliamentarianism in the 16th-20th centuries), edited by H. Gmiterka, S. Piątkowski, J. Wrona, Radom 2005, pp. 59-82. Ustawodawstwo (Legislation), see Volumina legum, Publisher J. Ohryzko, vol. 9, Petersburg 1860.